We get a lot of questions when we help families find the perfect assisted living situation for their loved ones. Families want to know about care plans, staff qualifications, and safety. There are so many serious issues to consider, and we know how difficult it can be. Because of that, we wanted to talk about one of the most festive and heartwarming times in assisted living. Celebrating the holidays! The holidays are a great time to reconnect with family living all over the country. Consider reaching out to loved ones who live far from home, and ask them to visit in the locale of the assisted living community. It can be a health risk and a fall hazard for some seniors to travel, and many folks are used to the accommodation’s their community makes for them. As much as families members care, we are often not the ones best equipped to take care of our loved ones. If you can encourage family members to center their celebrations around the locale of your loved one’s assisted living community, you can create a wonderful homebase that prioritizes the seniors in your life. They will appreciate it, and your family can relish in everyone’s safety and comfort. Local community groups are generally very plugged in to local retirement homes, assisted living communities and board and care homes. During the holidays, communities will often organize performances from local choirs and theatrical groups. Sometimes they will host dinners or bingo nights as well. 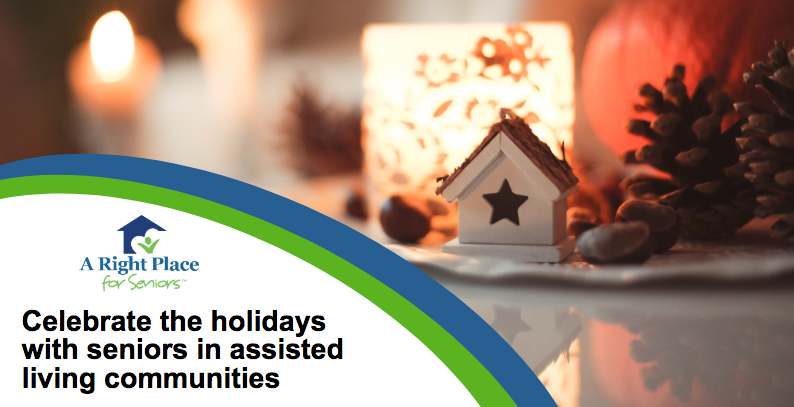 Reach out to your assisted living community and find out what events are on the calendar for the holiday season. Sharing these events with your loved one is a great way to make new memories and traditions. Many communities do it up for the holiday season, but a little personal touch can go a long way. Take the time to collect a few personal holiday decorations, or print out and frame some photographic memories. When you find the right one, an assisted living community is a great place to make sure that our parents, grandparents, and older loved ones have proper care and great socialization. It is also a great place to gather the family, and share the love during the holiday season. When your elders are comfortable and taken care of, the whole family can relax and enjoy. Did you find this information useful? Please share this information with your family and friends! When you share our blog posts, it helps new people learn about our free services. What does A Right Place for Seniors do? A Right Place for Seniors is a senior placement service. We help families find great senior housing and senior care accommodations. Our services are always FREE for families. We consider your financial situation, social preferences, location needs, and every concern you have about the senior housing search. Our senior living consultants are experts in each of their areas, from Southern California, to Colorado, to Oregon. At the end of the day, we hope that you find a great place for your family members. It is our goal to make the process as stress-free as possible. Let us know if you have any questions. You can also contact us for more information on our process.